Footballguys/Draftguys writer Sigmund Bloom mentions Cadillac Williams as an under appreciated NFL player - not fantasy player - NFL player. Bloom could see him as the 2000s version of Rocky Bleier. Photo by Sienc. In this part of my conversation with Sigmund Bloom, Footballguys senior staff writer and Draftguys co-founder, we discuss under appreciated NFL players, emerging NFL players, the Bloom 100, what he’s watching when he’s evaluating players, and why he plays in 25-plus fantasy leagues . Waldman: Aside from fantasy football, just as a fan of the game, tell me about some players you’ve seen as you watch all of these games who you feel are underappreciated to the average fan. Bloom: Yeah. Wow. Of course, I’m going to start with the Pittsburgh Steelers. If you watch what they ask their players to do then you’ll understand why James Farrior is the guy that James Harrison, Lamar Woodley, and Lawrence Timmons get a lot more attention because of him. Posse is just there every game whether it’s coverage, whether it’s run-stuffing, whether it’s blitzing. This is the guy that has really been the unsung hero of that Steelers defense. And I really believe that because of the guys he plays with – Troy Polamalu – he is never going to be one of the first people mentioned in a discussion of great NFL linebackers but as a lifelong Steelers fan and someone who is passionate about the Steelers organization, he is one of those guys. 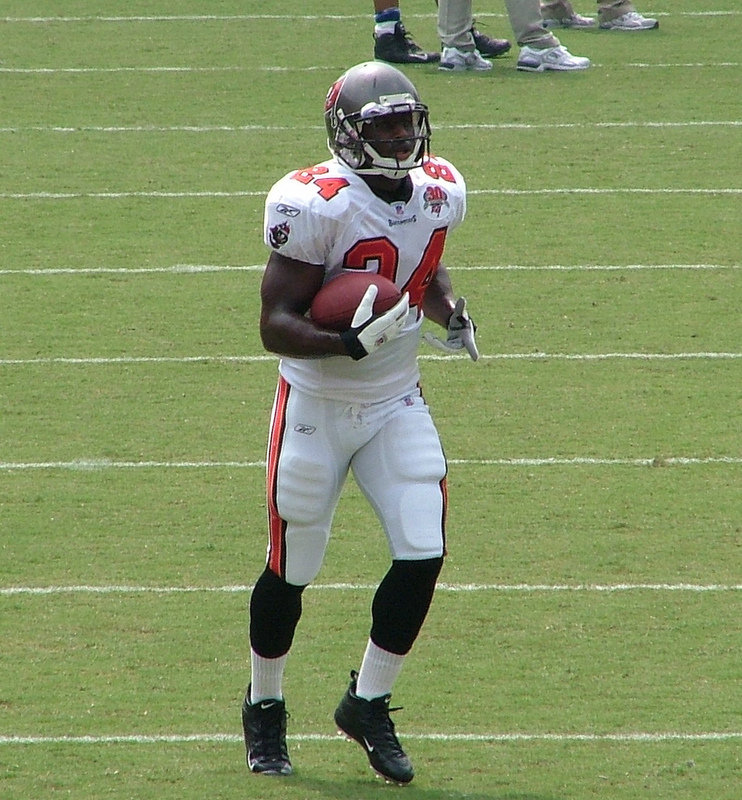 Some of the other players…somebody who has never gotten due is Cadillac Williams. He’s persevered through so many injuries. To come all the way back and then suffer another catastrophic injury twice…and he was clutch for Tampa Bay last year! Them becoming a winning team last year was a lot due to the offense and he did some amazing things on third down for this team. I’m honestly shocked that they aren’t trying to bring him back. I think whomever he goes to will find that he will be an important contributor and fan favorite. I can only hope that the Pittsburgh Steelers will be one of the teams that eventually gets in the running for him. We’re not going to talk about how great Williams is for fantasy football, but I do believe he is a player who has great value to a team. Waldman: He could be the modern day version of Rocky Bleier. Waldman: And I’m glad you mentioned Williams. At Auburn he was just unbelievable. It’s a shame to see what happened with him. Injuries are such a great equalizer in the sport. I often think what could have been with his career. As I’ve gotten to know you over the years I’ve learned that you’re a very intuitive guy. Tell me about your gut feeling about some players who are on the cusp of emerging into the public consciousness. Bloom: Earl Bennett comes to mind right away. I think he has an excellent all-around game. He’s not the biggest, fastest, or most explosive, but I think he comes through for his guy. I think you’re going to see him rise to the top of the Bears passing game. I think people forget that he’s only 24 years-old. He’s just now entering his prime. You have the connection between him and Jay Cutler. You have Mike Martz saying that Bennett wasn’t involved as much as he should have been last year and that will be rectified. Another name that I still like, but apparently the Bengals don’t – which could actually be a good thing – is Bernard Scott. They may be convinced that he can’t carry the load and they were rumored to be sniffing around Brandon Jackson which means they might not eveng think Scott is a good third-down back, but he’s explosive, a natural runner, he has incredible lateral agility and a great burst out of his cuts, he’s a great receiver, and he put up pinball machine numbers at Abilene Christian. Granted an NFL-caliber player is supposed to put up those numbers at a small school program and absolutely eviscerate defenses, which Scott did. Those two guys I think will emerge this year if given the opportunity and I think Bennett will absolutely get that opportunity. Another player I have to bring up is LeRon McClain. I know I sound like a broken record when I talk about him. I just go back to 2008 and as a Steelers fan I just dreaded seeing LeRon McClain with the ball in his hand on third and short. And the Steelers strength of the defense for many many years now has been third and short. I would rather have almost anybody against us in third and short than third and long, but McClain just kills us there. We’re also seeing this trend with runningback-fullback ‘tweeners becoming much more viable running backs: Peyton Hillis, Mike Tolbert, and Jason Snelling show that they can be primary or very big parts of backfields. I think LeRon McClain still has some time left in his career where he’s going to get the ball in his hands. Waldman: I like your thoughts about Bennett. I liked him a lot out of Vanderbilt, but my enthusiasm slowly faded. I think you’re arguments are good and I’ll have to reconsider him and take a look at his game. It’s easy to devalue players or lose enthusiasm for them when they don’t pass the eyeball test when it comes to athletic flash – especially when his own team isn’t featuring him as prominently as the initial promise you see from a prospect in college football. Sometimes these teams do come around. You’re one of the early adopters of Twitter for football discussion. I don’t want you to tell us why Twitter is great. We already know that and you promote it every week. I want you to give us an idea of the kinds of things you do with your Twitter experience to get the most out of it. Bloom: I’ve been blessed/cursed with a channel surfer’s mentality when it comes to life. So Twitter’s perfect. It’s just so easy because it’s just about scanning it and the 900 or so names I’ve compiled will have views or takes that just stand out. The other thing is just the real time nature of Twitter. When someone posts something interesting you know that they are around so you can follow up and get something back from them. If a beat reporter files a Tweet from his practice report, you can contact him and ask him about different players or get additional information. It’s a level of participation that hasn’t been there before that is so stimulating. The community aspect and real time agrees with me in a strong way. Waldman: I think the Bloom 100 is one of the better annual articles that combines fantasy draft strategy and analysis with NFL draft prospects. Tell me about the origin and intent. Bloom: This just goes back to my person take with fantasy football. Before 2005 I was in leagues that were 20-team, 40-man rosters, and contracts. You had to scout as deep as you could. Players that were fifth receivers or third running backs were important to lock up with cheap contracts and wait for them to emerge. So rookie drafts were obviously a big part of how you could get a head in these leagues. They were also combined offense-IDP leagues and there was just nobody out there trying to rank players where you weighed the merits of taking the 3rd linebacker off the board or the 10th receiver. Are you looking for an upside running back or a safe injury handcuff who might not have a high ceiling but he’ll definitely make the team and will get a chance if the starter gets hurt. I wanted to write something that ranked these players but at the same time addressed how you sort these guys out. It’s a very inexact science. I could sit down and give you Bloom 100 and the next, give a completely different one. It would be different depending on scoring systems or if I factored an individual’s team roster into it. But having that starting point is an open to a conversation. It’s not the last word of the conversation, either. I think it’s one of the most interesting conversations because rookie drafts in dynasty leagues are where you have to put your money where your mouth is. It’s so fun to prepare for a rookie draft – just as much as preparing for a re-draft – and it was something that I did to organize my own thoughts. I couldn’t be more pleased that people have found it to be a value. Waldman: We play in a lot of fantasy leagues. I’ve had people tell me I play in a lot, but I have feeling you play in a lot more. How many leagues do you generally play in. Bloom: I have about 10 dynasty leagues that I have picked up along the way. Some I have been in as long as 6-7 years. Some are brand new. I usually do between 5-10 Survivor or Best Ball type drafts where league is scored automatically without managing lineups. I probably do at least 5 mock drafts for analysis and articles. Of course, there’s the Football Guys Staff League that’s a re-draft league and 3-5 others I get into. I may do 25-plus drafts and have 10-15 teams tracked per season. Waldman: Why do you do so many? Bloom: Partially it’s because tey are laboratories for articles or answering people’s questions. I get an idea in a 16-team league how scarcity of a position effects trade value versus a 12-team league. Or the effect of PPR versus Non-PPR scoring. Where drop-offs come at positions and where you need to act. And honestly, after I get my work done at the end of the night, I start to pull up all my teams and I have my reminders set in my calendar when the waiver wires run and I play GM. It’s just fun to do. That’s what it’s all about. I can’t get enough. Waldman: Tell me about your game-watching habits. Is there anything special that you do to evaluate a player? Do you take notes? What do you suggest to people who want to become a student of the game? Bloom: This is kind of a know-it-when-you-see-it thing. One, does the player do what he intends? You watch player and there is strong intent with every step; every muscle contraction; every confrontation with an opponent. The flip side of that and it sounds counter intuitive is whether they do it without thinking about it. Do they act as if they were born to do it? Those are the players that I want. To put it in specific terms, let’s talk about quarterbacks. I want someone who is going to take the hit to deliver the ball. I want someone who won’t look for pressure but will be able to sense it and avoid it. I want someone who will make an unorthodox throw from an unorthodox platform because he sees something breaking open. I want someone who will challenge receivers to make plays because he knows they can make them despite not appearing open. For running backs, I want guys who can break someone down in the open field. I want someone who wins collisions. I want somebody who has second-, third-, and fourth-effort. And obviously who runs with burst. Somebody who runs hot. Receivers, I want somebody who is a natural hands catcher. There are a few guys who are able to get by without it for a year or two, but they always end up fading into the background. And there are receivers who drop a lot of balls, but it has to do with concentration issues rather than hands technique. Terrell Owens and Brandon Marshall are still natural hands catchers. They pluck the ball out of the air. They don’t let the ball get into their body. They play the ball rather than let the ball play them. They have the my ball mentality, which is huge for any receiver. Waldman: Great stuff. That’s all I’ve got. Bloom: Yeah! Now let’s talk about jazz.